Welcome to the Hampton Inn - Suites Athens - I-65 ideally nestled at the base of the Smokey Mountains just 25 miles west of Huntsville Alabama. 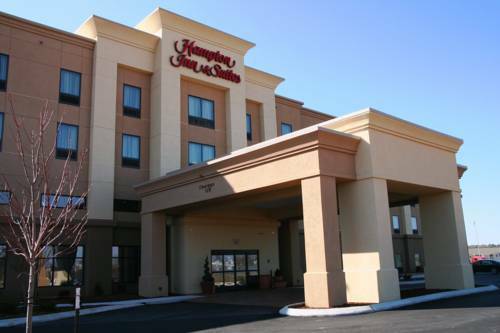 The Hampton Inn - Suites Athens - I-65 is a convenient destination located off I-65 at Exit 351 halfway between Birmingham Alabama and Nashville Tennessee. Come to shop and explore the charm of Historical Downtown Athens Alabama with its beautiful tree-lined avenues amazing history peaceful walking trails museums and inviting storefronts Athens is home to The Tennessee Valley Old Time Fiddlers Convention and a wealth of special events. You*re sure to find a good time enjoying blue grass music going to the rodeo cycling in a bike race perusing booths of local art attending the dogwood festival singing on the square and much more. The possibilities are endless when you visit our friendly Hampton Inn - Suites Athens - I-65. Business travelers and vacationers alike will be delighted by the indoor swimming pool comfortable amenities and outstanding service at the Hampton Inn - Suites Athens - I-65. We*re close to restaurants Athens business districts The University of Athens Wheeler National Park Elk River and much more. You*ll discover the best our beautiful city has to offer when you visit our comfortable Hampton Inn - Suites Athens - I-65 hotel. At the Hampton Inn - Suites Athens - I-65 you*ll find exactly what you need. Whether you*re traveling for business or pleasure in our spacious rooms and one room suites you*ll enjoy all the extras our hotel has to offer. Along with earning Hilton HHonors Points and Miles you*ll enjoy a complimentary On The House hot breakfast free stay for children under 18 accompanied by parents exercise facility and the 100 Hampton Guarantee. You can start your weekday morning with a complimentary USA Today newspaper in our *Perfect Mix* lobby while relaxing with a complimentary cup of coffee or tea offered 24 hours a day. We look forward to seeing you. All reservations must be cancelled 24 hours prior host time unless deposit is required. If this reservation has been made electronically please cancel it electronically to avoid confusion and a no show bill. Policy is subject to change.